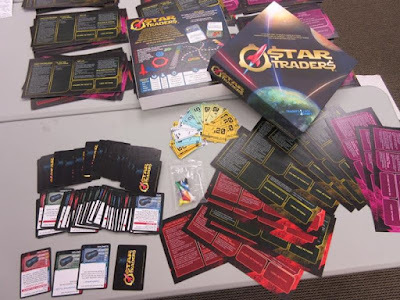 "Star Traders" is a competitive cargo-delivery Sci-Fi board game. Players captain their starships, jumping from planet to planet, racing to deliver their cargoes before the other traders. The game ratchets up the interaction and the fun as you gain great wealth and the Emperor's respect, giving you the opportunity to petition to be made Star Tsar, ruler of all trade in the galaxy. But stumbling blocks are around every corner as your fellow traders pursue the same goal. 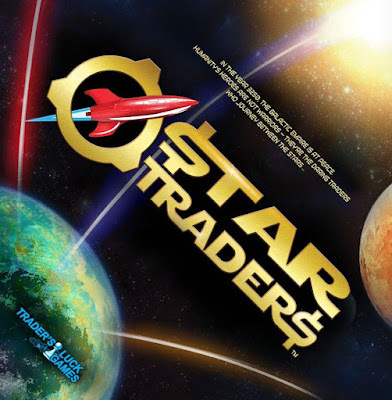 Brought to you by creator David Ladyman, "Star Traders" is a redesign and upgrade of his original game published by Steve Jackson Games in the late ’80s. In it you are a heroic starship captain navigating the galaxy’s trade lanes in search of fortune and glory. You must make deals, deliver cargoes and traverse risky jumps, all while competing against your fellow captains in a SciFi themed universe filled with iconic tropes. The game is available on Kickstarter right now! "Star Traders" is a great game that combines strategy and fun into an irresistible combination. The point of the game is to deliver goods from one planet to another in order to obtain this game's galactic currency called starbucks (which triggered a lust for Starbucks products from my wife) and to earn prestige to gain favor with the Emperor of the universe. And of course, each player is competing for the same delivery contracts which adds a whole other immediacy to the game. Not only can other players beat you to the punch, they can also deliberately sabotage you by playing Trader's Luck cards in which some of them can do a variety of bad things to you. 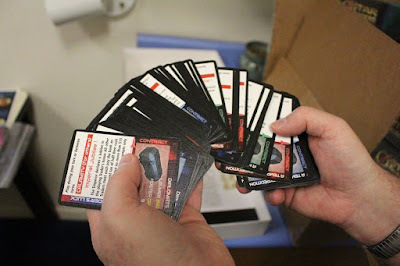 They're called calamity cards and they do things like force you to go to a certain planet away from your intended destination, or to a random jump point somewhere in the universe. The cards are a lot of fun to play on other players, but it's not so fun when they do it to you. There is a way to stop them though, as there's also avoid calamity cards which can prevent them from happening, but in my experience, there aren't too many of those in the deck. Some of the Trader's Luck cards can also help you by giving you starbucks or extra actions, but you can only have two of them at a time. You get five dice to represent the amount of actions that you can do per turn. Those actions can be used to travel to other worlds and pick up cargo, with each attempt for travel to be determined by the distance between them which is color coded by difficulty. For example, if the route is green, it's the longest jump between systems so you will need to roll a 6 to do it. Each attempt takes one actions so there was many turns where I sat in the same system using all of my actions trying to roll a 6. To make it easier, you and other players can also build space stations for a nominal fee. Not only will it help you in the end game win favor with the Emperor, they also allow you to jump from your station to another station without having to roll at all. It just takes an action and it's a nice feature. Plus, you can also try to charge other players to use your station, which is a fun bonus. I played with two other adults and my seven year old son and we decided to play the Family version of the game and my son picked it up easier than the other two adults so I'd recommend that level for kids around that age. Speaking of my son, he really enjoyed the game. It kept his attention and he also really liked causing calamities for other players. I was pretty impressed with his level of strategy and I think this game does an incredible job of making tactical thinking fun. I also really liked the many references to other sci-fi films, books, and television shows. My wife especially liked the Trader's Luck card based on Firefly/Serenity. The personalities that you can choose from that add special abilities also add quite a bit of fun to the game. My son liked being an Engineer which gave him an extra action, while I played a rogue which allowed to be use any space station I wanted for free. Even though using personalities is optional, I would highly recommend it. 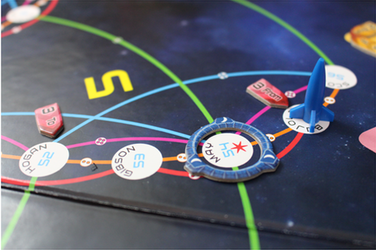 If you are looking for a fun game that the whole family can enjoy that's full of weaselly backstabbing and strategic planning, then "Star Traders" is the game for you. 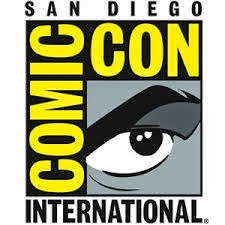 You can get your copy right now by helping creator David Ladyman revamp his original game from the eighties for modern audiences by supporting him on Kickstarter right here: https://www.kickstarter.com/projects/239709734/star-traders. Please back his pledge to bring this fantastic game back to the public!